Remarkably, this photograph is not a blogpost from Nerd Boyfriend. 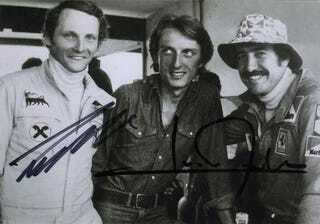 It is Scuderia Ferrari in 1974: drivers Niki Lauda and Clay Regazzoni flank their manager, a very young Luca di Montezemolo. A year after this photo was taken, Lauda went on to win his first of three world titles. This was before he became an owner of airlines under both his names: first Lauda Air, then Niki. Di Montezemolo managed the Scuderia for only a year before he ascended in the Fiat hierarchy, then returned to Ferrari after Enzo Ferrari’s death, only to ascend yet again and take over the entirety of Fiat after Umberto Agnelli’s death in 2004. He is also the founding president of the Formula One Teams Association. Regazzoni’s best year in F1 was the very year this photo was taken, when he finished the world championship only three points behind winner Emerson Fittipaldi. Six years later, he was paralyzed from the waist down in a grievous accident, when he hit a wall at the 1980 United States Grand Prix West at 150 MPH.